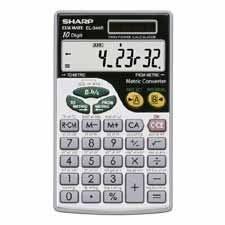 Metric calculator features a large LCD 10-digit display and three-key memory with change sign, square root and percent keys. Perform fractional calculations as well as 44 built-in metric and fraction conversions. Convert weight, measurement, volume and temperature applications. Twin-power operation automatically switches from solar cells to battery power in low light. Calculator includes a stylish metal case with compact protective wallet case.